1908 – On March 14, Virginia Governor Claude A. Swanson signed the General Assembly bill creating the State Normal and Industrial School for Women at Harrisonburg. 1908 – Julian Ashby Burruss was named first president of the new school. 1909 – On Monday, September 27, Nannie Sword of Lee County became the first student to arrive at the new school. There were two days for registration and for the students to get adjusted to new surroundings. School opened for classes on Thursday, September 30. The enrollment was 150 with a faculty of 15 on a campus of around 50 acres. The three buildings of the Normal School around 1918. 1910 – The school operated its first summer session – the first held in Virginia. Men and women students attended. 1911 – The first 20 graduates received diplomas. 1914 – The school's name was shortened to the State Normal School for Women at Harrisonburg . 1916 – Authorization was received for the school to award bachelor's degrees. Previously, only diplomas for post-high school work had been awarded. 1919 – Dr. Samuel Page Duke became the institution's second president. 1924 – The institution was renamed the State Teachers College at Harrisonburg. The University Farm, with its large farmhouse, was purchased in 1929. 1927 – Hunter Lee Jackson of McGaheysville completed the college's two-year professional course and became the first male to receive a diploma from the institution. 1928 – Ernest F. Bowman of Harrisonburg became the first male to receive a degree. 1929 – The 31-acre University Farm, located on the North River near Port Republic, was purchased. 1938 – The institution was renamed Madison College in honor of President James Madison. G. Tyler Miller became Madison's third president in 1949. 1938 – Enrollment passed 1,000. 1946 – For the first time, men enrolled as day students during the institution's regular session. 1949 – Dr. G. Tyler Miller became the institution's third president. 1952 – The college purchased an additional 240 acres south and east of the original campus, bringing the total size of the campus to more than 300 acres. 1954 – The college was authorized to award master's degrees. The first residence hall for men, Shorts Hall, in the early 1970s. 1964 – Enrollment passed 2,000. 1966 – The General Assembly approved full coeducational status for the college, and men were enrolled as resident students for the first time. 1971 – Dr. Ronald E. Carrier became the institution's fourth president. 1971 – Academic divisions were reorganized into schools that eventually evolved into the College of Arts and Letters; the College of Business; the College of Education; the College of Integrated Science and Technology; the College of Science and Mathematics; and the College of Graduate and Professional Programs. 1972 – Enrollment passed 5,000. 1972 – The school played its first football game on Oct. 7, a 6-0 loss on the Godwin Hall Field to the Shepherd College junior varsity. 1977 – On March 22, Virginia Gov. Mills E. Godwin signed the bill changing the name of Madison College to James Madison University. The name change was effective July 1. 1979 – The university was authorized to award educational specialist degrees. 1983 – JMU celebrated its 75th anniversary. 1983 – The first honorary doctorates were awarded. 1983 – For the first time, JMU was cited by U.S. News & World Report in its annual ranking of America's best colleges and universities. 1987 – Enrollment passed 10,000. 1989 – A 110-acre tract of land across Interstate 81 and east of the main campus was purchased by the university. 1994 – The university was authorized to award doctoral degrees. 1994 – The women's field hockey team won JMU's first NCAA national championship, defeating the University of North Carolina 2-1 in overtime. 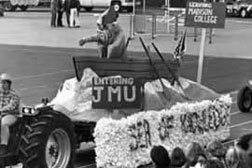 1994 – The JMU band, the Marching Royal Dukes, won the Sudler Trophy which is emblematic of being the best college band in the country. 1997 – Enrollment passed 13,000. 1998 – Dr. Linwood H. Rose became the institution's fifth president. 2001 – Enrollment passed 15,000, with a full-time faculty and staff of more than 2,000 on a 495-acre campus. 2004 – The football team won the NCAA Division I-AA championship, defeating the University of Montana, 31-21. 2005 - The university announced that it was going to purchase Rockingham Memorial Hospital when the hospital moves to its new site in 2010. The hospital complex, which is adjacent to the JMU campus, includes 15.8 acres, nine buildings and two parking decks. 2006 - The university purchased the old Harrisonburg High School complex and renamed it Memorial Hall.